“We believe that if we offer this treatment in the earlier stages of nasopharyngeal carcinoma, accompanied with chemotherapy and radiation, we can further enhance survival rates.” –Prof. Rajiv Khanna. 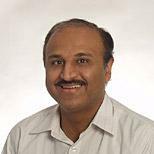 Professor Rajiv Khanna (pictured), who heads the Australian Centre for Vaccine Development at QIMR, said by enhancing the immune cells of NPC patients they have doubled the survival time of terminally ill patients. Illustration: Queensland Institute of Medical Research.